The Moscow Stock Exchange (MSE) has published its first report under international standards since its initial flotation of stock. As of the end of 2012, net profit had risen by 22 percent to 8.2 billion rubles ($263.46 million), while total revenue had went up by 27 percent to 21.55 billion rubles ($692.39 million). The MSE gained on the currency, derivatives and money markets, and it secured high interest yields. Yet the generally positive report was unable to prevent stock prices from falling. The MSE's aggregate commission fees rose by 14.6 percent to 11.4 billion rubles ($366.28), but they underwent a radical restructuring. The stock market continues to fetch the lion's share of commission revenue, but it fell from 42 percent to 27 percent. The main reason was a 21-percent drop in trading volume, down to 24.1 trillion rubles ($774.33 billion). "The stock market has become less attractive from a revenue perspective," says senior portfolio manager of Kapital Management Company, Vadim Bit-Avragim. In addition, the currency market now accounts for 17.6 percent of commission revenues (representing growth of 28 percent to 2.008 billion rubles), as do operations in the money markets (a twofold increase to 2.01 billion rubles). Moreover, the MSE has started to earn far more from the placement of temporary surplus funds. Interest yields are up by more than 1.5 times (to 10.34 billion rubles), particularly as a result of high interest rates on deposits and coupon yields on bonds used as vehicles to invest temporary surplus funds. However, losses were not avoided: a revaluation of the traded securities portfolio wiped off 650 million rubles ($20.88 million). Yevgeny Fetisov, MSE chief financial officer and board member, puts this loss down to the decrease in the value of securities — primarily, Federal Loan Bonds (OFZ), which were invested as own equity, along with residual client funds. However, the result should be viewed in light of the interest earned on securities, according to Fetisov. "Despite the decline in the value of securities, the interest yield made up for the negative revaluation, while securities operations turned a profit," he says. Meanwhile, chairman of the Supervisory Board of GK Alor (an MSE shareholder), Anatoly Gavrilenko, does not look too kindly on the distortion in favor of traditional banking revenues. "It would be preferable if most revenues came directly from exchange activity," says Gavrilenko. Investors have been slow to respond to the MSE's positive report. 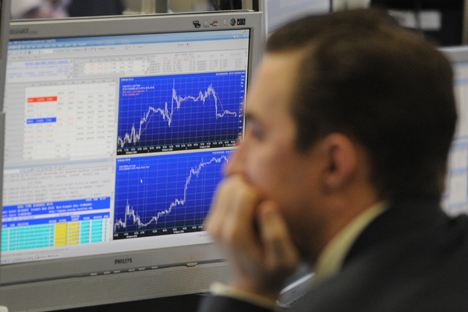 In the course of trading, the value of shares on the MSE dropped to the 48.38-ruble mark — their lowest since the IPO. At the close of the session, the price stood at 48.59 rubles ($1.56). As of April 2, the market value of the MSE amounted to 115.5 billion rubles ($3.71 billion), down 11.6 percent (15.2 billion rubles) on the IPO valuation (130.8 billion rubles). According to Timur Salikov, investments director at Promsvyaz Management Company, the drop in the share price that coincided with the publication is only partially due to the results themselves. MSE shares have been almost in free-fall since VTB Capital's support for quotes ended in mid-March. At the same time, the trading volume of shares also plummeted. Last week, it stood at just 8.2 million rubles ($263,465) — less than a fourth of the average indicator for the previous two weeks and 12 times lower than the average trading volume during the stabilization period (107 million rubles). "In view of the sharp reduction in the volume of trading, the exit from securities of small investors has led to a marked decrease in the value of shares," says Salikov. Elena Loven, a manager at Swedbank Robur Rysslandsfond, which purchased shares during the IPO, is not surprised: "We weren't banking on short-term results and do not plan to exit for at least another year." The end of the year is when Loven expects stock market turnover to grow through the introduction of a convenient T+2 trading mechanism and the arrival of foreign players.